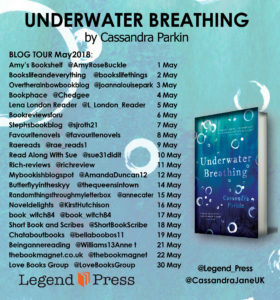 I’m delighted to be reviewing Underwater Breathing by Cassandra Parkin today as part of the blog tour organised by Legend Press. I’d like to thank Imogen Harris from Legend for the place on the tour and the review copy. 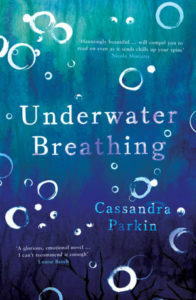 If you like the sound of Underwater Breathing then you can buy it now in ebook and paperback. Cassandra Parkin is a wonderfully intuitive writer. Her prose is gorgeous and her stories are hauntingly beautiful. I had the pleasure of reading The Winter’s Child last year and I loved it, so was really keen to read this, her latest book. In fact, I think Underwater Breathing has much more of an affinity with one of her earlier books, The Beach Hut, which also had a strong brother/sister relationship and a link to the sea. This time, the brother and sister are Jacob and Ella. When the book opens in 2008, Ella is 7 and Jacob is 10 years older. They live with their parents (although Ella’s mother is Jacob’s stepmother, he does call her mum) in a house ‘at the end of the world’. On the east coast of England, the house is huge, with a bathroom in a turret, and is in great danger, sometime in the not too distant future, of falling into the sea. Ella and Jacob have an unusual relationship. She is devoted to him and, despite the age difference, he dotes on her. But their parents have a difficult relationship and so the youngsters’ bond is even stronger. There are very few characters in this story, but the family’s neighbour on the clifftop, Mrs Armitage, plays a huge part in it. She’s prickly, hostile, unfriendly at times, but I really liked her no-nonsense style, her way of dealing with things. Jacob and Ella come to rely on her in different ways, not least as a way of escaping their home life. Parkin’s writing style is lyrical, I can think of no other way to describe it. I found that it took a little getting into the story again each time I picked it up and I think it’s because it’s quite intense. But once I was back in the zone I found myself fully absorbed in the lives of the unusual characters. The turn the story takes was no surprise to me. I can’t say much because of spoilers, but the author managed to make it very obvious without saying anything. I think she’s very clever in that respect, definitely showing and not telling. As for the setting, well it’s genius really. The sea is a foreboding presence throughout. Ella is scared of it, there’s a constant threat of the cliffs falling and taking the houses with it. But it’s also about how water can envelop you, and when it does so there’s nothing else around but the sound and sight of the water. In a strange way, what is most to be feared is also a saviour. Underwater Breathing is quite a read. It’s about relationships, love, fear, loss. It’s a book of layers, there’s a need to explore between the lines. I found it totally engrossing. Cassandra Parkin grew up in Hull, and now lives in East Yorkshire. Her short story collection, New World Fairy Tales(Salt Publishing, 2011) won the Scott Prize for Short Stories. 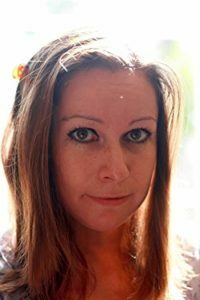 Cassandra’s writing has been published in numerous magazines and anthologies.